Mud pie is a chocolate-based dessert pie traditionally made with a crumbly chocolate crust and topped with ice cream. My healthier GF/DF rendition is made with a walnut, date and cocoa crust, with a dairy free chocolate filling and finally topped off with coconut cream. 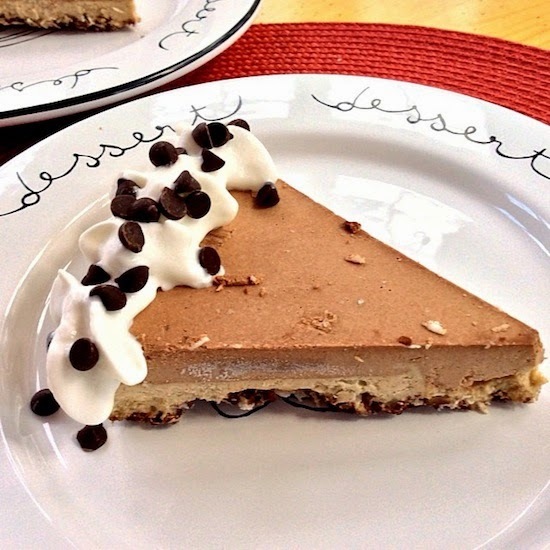 This easy GF/DF Mud Pie is the perfect make ahead holiday or any day dessert. Prepare the crust by pulsing walnuts and cocoa powder in a food processor until it resembles a fine meal. Remove and set aside. Place soaked dates in the food processor and process until small bits remain and it is sticky. Add back in the walnut/cocoa meal and process until well combined. Transfer to a glass pie pan lightly oiled with coconut oil. Place a piece of plastic wrap over the crumbs and press with your hands to form a uniform crust that goes up the sides of the pie dish. Put in the freezer to set. Melt the chocolate chips over a double boiler or in the microwave. Once melted, work quickly to add to a blender along with the cream cheese alternative, vanilla extract and coconut milk. Blend until smooth, about 1 minute, scraping down the sides as needed. Pour over crust and smooth. Cover and freeze until set. Alternatively, refrigerate for at least 2 hours or until firm. For easiest serving and longer storage, freeze. Serve and top with coconut whipped cream. (Note: SO Delicious now makes a fabulous coconut whipped topping sold in the frozen food section of Whole Foods which is a great alternative to making your own coconut whipped cream.) This pie will keep in the fridge for several days, or freeze for up to a few weeks, covered tightly. We will just love your Mud Pie! Thanks so much for starting 2015 with Full Plate Thursday and have a great week. Yum! Sounds delicious and easy to make. I could fall in love with this pie no gluten. thanks for sharing on Real Food Fridays. Pinned & twitted. Yum! This sounds delicious and easy to make. I could fall in love with this pie - no gluten Thanks for sharing on Real Food Fridays. Pinned & twitted.